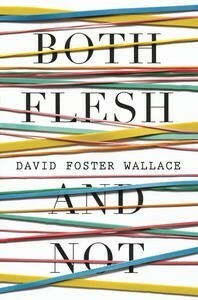 I’ve never read anything by David Foster Wallace, so I was quite pleased when Penguin sent me a collection of his essays entitled Both Flesh and Not. Wallace is the cult author of Infinite Jest (listed in 1001 Books You Must Read Before You Die) and also an unfinished novel called The Pale King. Of course, I was never going to read an essay about Terminator 2 (which is a film I’ve never seen) or the one about Roger Federer (who plays tennis) or about the US Open. In fact I was a bit startled by the idea that a serious essayist would write a 30 page essay about somebody who plays tennis. I mean, it’s just running around on a court hitting a ball with a racquet. For a while, somebody is always going to be the best in the world at that, but so what? But impressed by this author’s reputation as a wordsmith, I flicked through the Table of Contents to see what I might like to read from this collection. In other words, it’s about the audience rather than the intrinsic qualities of the book. And with ‘mathsy’ books (that’s my word, I just made it up) ‘the precise ways in which they’re not very good, will vary directly with how much the individual reader already knows about the extraordinary field’ being dramatised. Higher maths, he says, is beautiful and interesting, but lots of people are scared off it by how hard it can be at the lower levels that one needs to work through in order to reach the pinnacle. Well, I’m not about to argue with the likes of David Foster Wallace but I have to say that even though I didn’t understand all the maths and science in Seduced by Logic, by Robyn Arianrhod, I still found it a very interesting book. Of course he could not have read this one because it was published only last year. But Wallace had also obviously never read Sue Woolfe’s Leaning Towards Infinity (2000) either, (perhaps because books by Australian authors failed to attract his attention), but if he had he would surely have included it in his musings because it was a much better book than Fermat’s Last Theorem, and by the sound of them, the other books he discusses as well. What do you think about what Wallace says about reviews of genre fiction? Is it true that the reviewer of genre fiction asks ‘to whom will this piece of fiction appeal?’ rather than ‘is this piece of fiction good?’ If you read or write reviews of crime or other genre fiction, do you agree that this is the basis on which these books are reviewed? What do I think? I think I want to read David Foster Wallace – because I never have. Infinite Jest collects infinite dust on my shelf. I’m impressed you tackled his essays. About his idea re different critical approaches to different genres – I wonder about definitions. To me literary fiction is simply like gourmet cooking – any genre can be literary just as any food item can be a gourmet version – in my mind literary is not a genre, it’s a matter of style, structure, themes which are above and beyond the actual plot or non-fiction substance of the book. Still, I agree that non-fiction books which develop an idea or fiction which follows a formula do indeed need to be looked at by critics for something other than literary quality – basically because they are not written for audiences who appreciate that in those types of works. History and math books have to put clarity ahead of literary styling in order to be effective and appreciated by their readers. I read A Beautiful Mind’ by Sylvia Nasar and Fermat’s Enigma by Simon Singh (1998) and thoroughly enjoyed both. And I’ve read far more difficult “genre” material both science and history. Imo, if they pay more attention to literary value they lose clarity and also their readership. Yes, I agree with Wallace but probably for different reasons. (heh) I know there are some well written “genre” books out there. I can follow the vocabulary well enough – but they don’t appeal to me for the literary value but for their topical substance. These books should be evaluated by criteria other than their literary value. Sorry for the rambley rant. You touched a soapbox. Aczel, Hoffman, Nasar, Berlinski and Seife are given as examples of math’s new cachet but the genre David Foster Wallace is talking about (we assume ‘mathematical fiction’ but the phrase is never used) includes the novels he is reviewing: Uncle Petros & Goldbach’s Conjecture by Apostolos Doxiadis and The Wild Numbers by Philibert Schogt. Lisa seems to talking primarily about the ‘new cachet’ nonfiction works and only briefly mentions genre fiction at the end. Maybe one day you can blow the dust off Infinite Jest and we can read it together. And hey, Several, Four, Many, you are quite right, I haven’t commented on those other books because I’ve never heard of them. You’re not alone. They are so obscure I thought DFW had made them up–in the tradition of Borges reviews of non-existent books. I had to check to verify they were real books. DFW may have been one of the few to read them. The Wild Numbers is ranked 2,628,048th on Amazon’s best selling book list. LOLthe publicity from his review didn’t make people rush out and buy copies, eh? Hmmm … I’m not going to answer the genre question because not being a genre readers and reviewer I can’t really. On the fact of it though, I think it’s a little odd as a black-and-white statement. But, I will say something about sport. I had heard of the essay about Roger Federer and have intended to read it for some time, though it’s a few years old now. It’s available on the net and so I have printed it out to read over breakfast tomorrow. I just wanted to say though that the older I get the more I think we arts-oriented people do ourselves a disservice by disregarding sport. Sport – perhaps not all, but tennis is a great example – is about drama, about beauty, and about character. The very things we tend look for in the arts. The funding mechanisms for sport vs the arts may be unfairly skewed but that’s a different issue. There may be concerns about cheating, drugs etc in sport. That’s a different issue too. My point here is simply about the essence of sport. There are probably sports I would not defend this way, but there are also areas in the “arts” I would not defend this way either. LOL Sue, I dare you to review the Federer one on your blog! I just might! And if I do I’ll link back to you. Interestingly on the first page (in the printout anyhow) her refers to the idea of “beauty” so he and I are on the same page (to some degree anyhow!). First though I have to finish my review of Cold light – hopefully when I get back home tonight – and then read your review of that (and link to it). At least I think you read it last year didn’t you? Then I might think of Federer! Hmm … I wouldn’t have chosen it as the winner (but I’m not saying I’d have chosen Funder as I haven’t read it). There’s a lot to like about Cold Light, I agree, but it just went on too much for me … Edith’s never-ending self-questioning and ruminations were too much. Oh dear, how did those typos get into the first para. I hate how that happens. Let me get this straight. You received a book for free – you perused the contents list and decided most of the topics weren’t for you. You found one that seemed quasi-interesting and thought you’d give it a go in spite of what you thought you ought to do. Then you proceed to take the author’s “main point” and argue with him (even though he’s been dead several years now) about all the exceptions to what he is saying without maybe taking a peek at ‘everything and more’ or any of the other supporting works (and ‘Infinite Jest while i am at it) that the author has written on this topic? Amazing. Was your point just to mention recent math books written in Australia? Or was it to actually review DFW’s book? I challenge you to read that piece about Federrer. I am not a huge fan of tennis (or lobster festivals, or state fairs, or cruises, or… or… or…) and still I was enthralled. His short pieces are a universe unto themselves. Each one different and gorgeous. Having read one short story does not a review make. But congratulations on not running across a single word you didn’t know. I gather you’re a fan, Djinn! So my little ‘non-review’ is an unwitting homage! Fancy that! I was thinking about sports just this morning – as I saw on CNN that some sports hero was seriously injured doing something. I wondered why that would make the news. Well – my moment of clarity revealed that the common man/woman can understand the rules of the games, he can identify with the “hero,” he can root for someone or a team. Not so in the arts. Success in the arts usually depends on some higher education available to only a few, the average person with a year or so of college doesn’t have the background for appreciating the arts. Sports are the common denominator – the great equalizer- in our society. Everyboy/girl can be a sports champ – even someone from your own local high school. And everyone can certainly talk about the recent “game.” I think this is becoming more and more true. Sadly, it leaves me totally out of it but oh well – I don’t go to movies either or listen to pop music either. I’m a unrepentant pop-culture ignoramus. After reading ‘The Marriage Plot’ which has a very unpleasant character which is supposed to be based on David Foster Wallace, my interest in him has plummeted. Also I’ve checked a couple of his books of essays out of the library, and was disappointed like you about some of the inane subjects he chose to spend his time with. I am a Math major who works as a computer programmer who somehow got devoted to literature. I’m turned off by this concept that because someone writes about Math all of a sudden its genre literature. I’ve read great novels about people pursuing vocations, hobbies, or subjects that don’t particularly interest me, and Math is no different. Literature is about the totality of life. Hmm, I’d have to read the essay again to be sure (and I’m not going to, I’ve already read it twice) but I think his argument would also apply to scientist-as-hero fiction as well, or LOL maybe computer-programmer or engineer etc. The general point, as I understand Wallace, is that fiction involving some knowledge which is not everyday knowledge tends to be judged/reviewed in a different way. I’m uneasy with that. I can’t see how a novel involving ‘difficult maths’ or esoteric science is any more genre-ish (another word I’ve just made up) than, say, a novel that doesn’t work for you unless you’re familiar with – um – Shakepearean quotations, or TS Eliot’s poetry or the Bible, or American politics;. The list goes on. Thanks for the link, I was interested in what you have to say there. But it was the post about Tolstoy’s Hadji Murad that really provoked my interest, I haven’t read that one yet! I had never thought of reading it until very recently. I’m not sure what brought my attention to it but I was surprised at how good it was. A real gem that has been largely missed by most Tolstoy fans. I’ve actually read Uncle Petros and Goldbach’s Conjecture and thought it a very nice book – certainly not great by any means. Obviously, comprehending the math wasn’t really necessary to enjoying and understanding the book or I wouldn’t have done either. I may be the ideal reader according to Wallace – I got through statistics II. I don’t understand higher math but I’m interested and enjoy reading “about” it – so long as I don’t have to actually “do” it or explain it. I’ve read other books which rely on math in the plot – The Oxford Murders by Guillermo Martinez for one. That wasn’t quite as good as Uncle Petros, but Martinez certainly tried hard to get the reader to solve the pattern problem he’d set up. Wallace doesn’t mention the Martinez book. I think Wallace is criticizing those “math novels” where the math is sloppy compared to those in which the math is clearer and at least accurate – “If math can be art, so sometimes can be genre.” (????) . The literary critics aren’t making this distinction – they’re only discussing who would enjoy the books. Wallace actually reviews a couple or three of them – does a good job, too, imo. – I can’t imagine a whole genre of these types of books – there aren’t enough good ones. Just wondering, was Wallace a maths buff as well as being a wordsmith? Yes, Wallace was definitely a maths buff. Math was an interest at university, he sometimes wrote about it and he organized a couple of his novels around math concepts. He thought of himself as a philosopher/mathematician/novelist. Trouble is he occasionally got in over his head and was sometimes wrong. Oh and I bet there would have been people who loved it when he was wrong LOL.